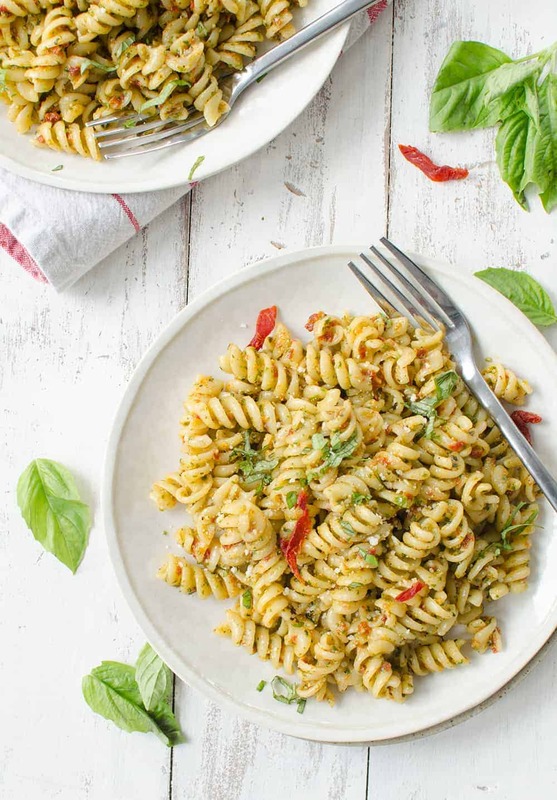 Sun Dried Tomato Pesto Pasta! 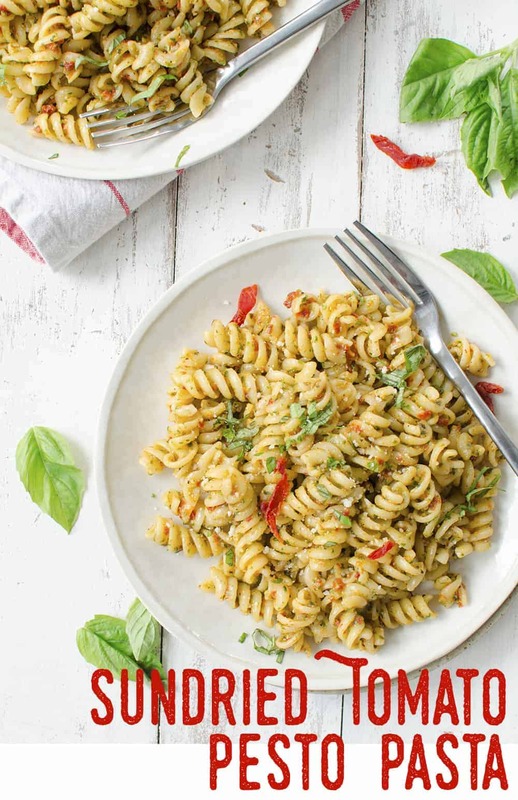 This 7 ingredient dinner is ready in just 20 minutes, perfect for busy nights! 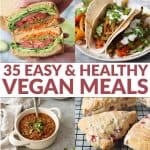 Vegetarian, easily vegan. Shouldn’t all meals be this easy!? A quick pulse of ingredients in the food processor tossed with hot pasta and voila- dinner is served. For this month’s Recipe Redux theme, we were encouraged to create healthy, no-brainer meals with 7 ingredients or less. 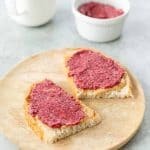 Since my normal 7-ingredient or less meals aren’t exactly show ready (bowl of cereal, avocado toast, egg sandwich), I wanted to feature my go-to meal when I don’t feel like cooking but still want something comforting and delicious. I present to you my sun-dried tomato pesto pasta. Pesto is my answer to just about everything. If I’ve got scraps of any herb lying around the house, chances are it’s going in a pesto. 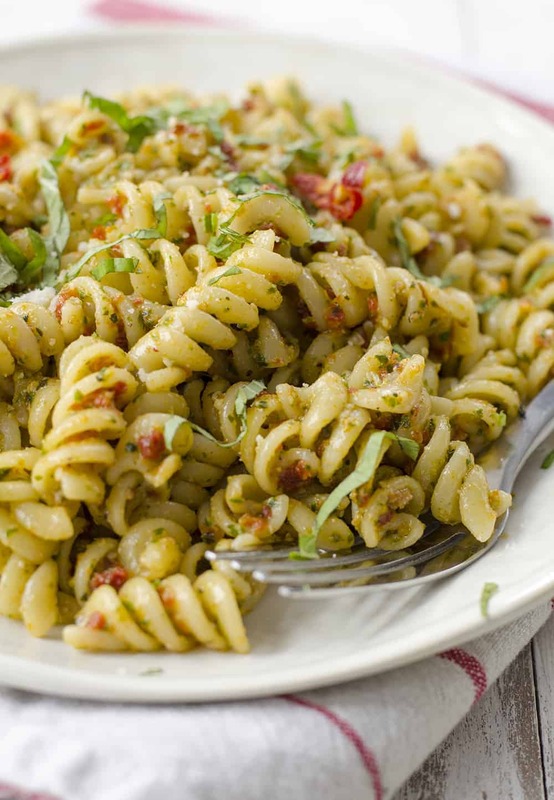 Once you make pesto a few times, you’ll realize that you don’t even need a recipe. A little bit of green, some garlic and aromatics, nuts or seeds for good measure, salt/pepper and a healthy drizzle of quality olive oil. Toss with just about anything. During the spring and summer months, I always have an excess of basil around the house. Which, I’m not complaining about. Basil might be one of my most favorite scents and I’ve got the candle and soap collection to prove it. 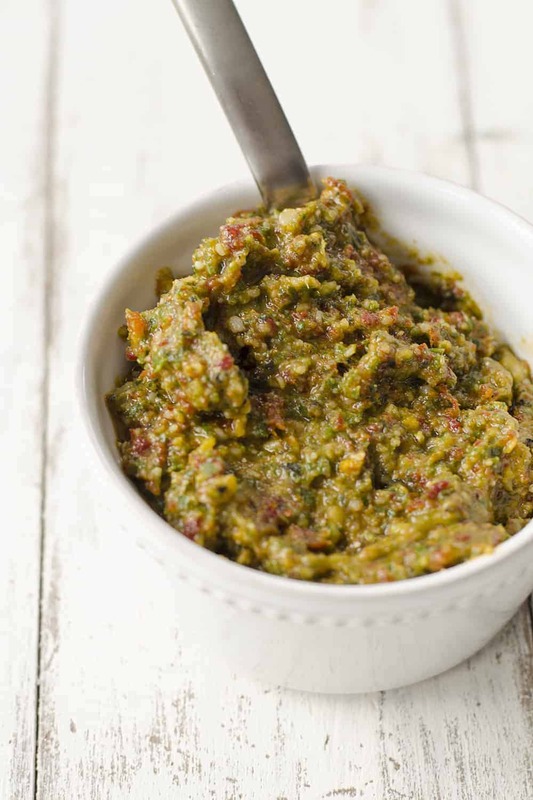 To put a spin on traditional basil pesto, I’m adding in another ingredient that always seems to find it’s way into my pantry- sun-dried tomatoes. I buy the dry kind not packed in oil, but if you happen to have a jar of the those use the flavored oil in this recipe instead of any additional olive oil. That’s it! If you wanted to break the rules and head above 7 ingredients, I think a can of garbanzo beans or tempeh crumbles (or really any hearty protein) would be the perfect topper. Save this one for busy nights! Bring a large pot of salted water to a boil. Add the pasta and cook until just al dente according to package directions. Drain, do not rinse and set aside. While the pasta is cooking, place the tomatoes, garlic cloves, basil and parmesan in a food processor and pulse until combined. With the blade running, drizzle in the lemon juice and olive oil until a paste forms. 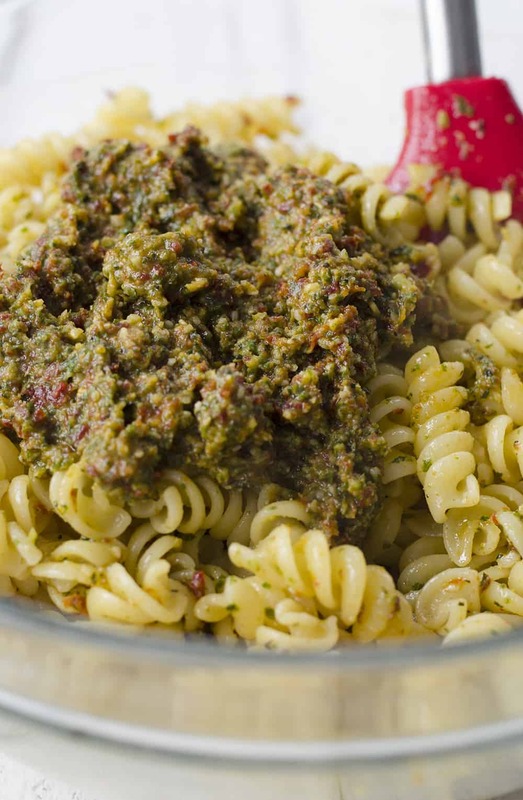 Remove the pesto and toss with hot pesto. Serve as is or at room temperature. If using sun-dried tomatoes packed in oil, then use the entire 8 ounce jar of tomatoes and oil together. Do not add any additional oil. 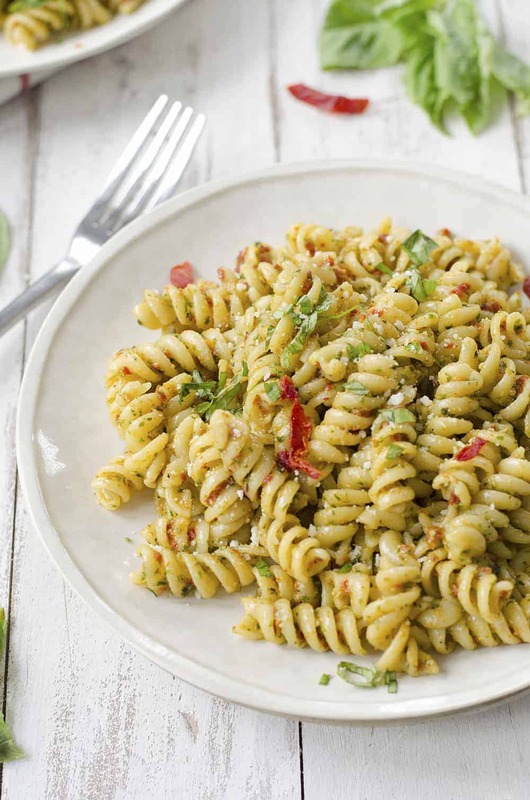 Great point to make pesto to prevent food waste – just grab bits of herbs or veggies around and whiz them up! This just looks so springy too. Yay! That is a beautiful non-green pesto 😉 Love it! Another fantastic pasta recipe from the Italian bred genius! I have to admit, now that you listed cereal as one of your go to meals in minutes, I’d like to challenge you to create a cereal with less than 7 ingredients that can satisfy my craving for Reeces Puffs or Lucky Charms :)… I’ll owe you for life lol! This looks incredible – and so full of flavour! Yum! This looks so flavorful! I love easy meals like this. Oh there are so many wonderful things one could do with that pesto! I love the idea of adding chickpeas to it. Awesome! Glad you liked it! Thanks for the comment.